The Global Volcanism Program has no activity reports for Ayelu. The Global Volcanism Program has no Weekly Reports available for Ayelu. The Global Volcanism Program has no Bulletin Reports available for Ayelu. Ayelu is a vegetated rhyolitic stratovolcano, located south of the Asbahri plain in the southern Afar region. 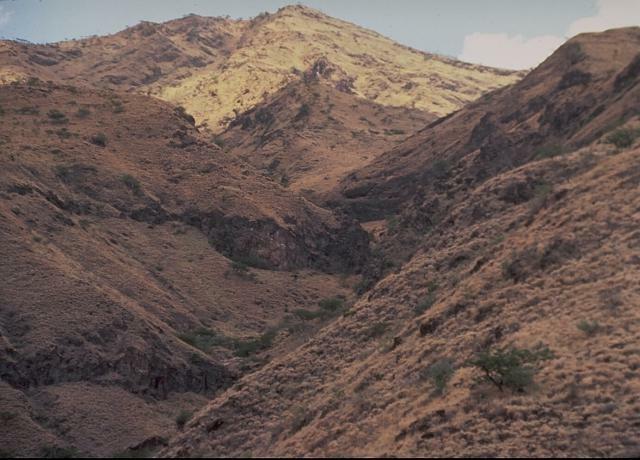 On its eastern side, 2145-m-high Ayelu is cut by regional faults and is overlain by ignimbrites erupted from Adwa volcano immediately to the east. It was constructed by a series of thick rhyolitic lava flows, creating a higher and steeper-sided volcano than Adwa. Hot springs are located on the western flank. Mohr P A, 1980. (pers. comm.). There is no Deformation History data available for Ayelu. There is no Emissions History data available for Ayelu. Ayelu is the westernmost and older of two volcanoes at the southern end of the Danakil depression. The vegetated rhyolitic stratovolcano is cut by prominent regional faults. Hot springs occur at its western flank. Its younger twin volcano, Aabida, has a 4 x 5 km caldera, which originated following eruption of voluminous pyroclastic flows, and a younger 2.5-km-wide caldera. Extensive young basaltic lava flows cover the flanks of Aabida and overlap a sedimentary plain to the SE. 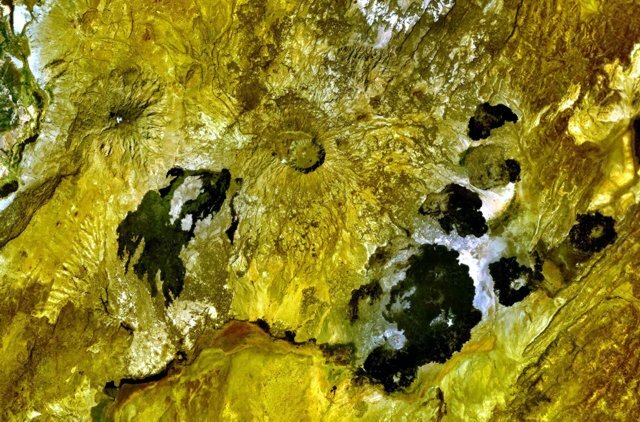 A 4 x 5 km wide caldera cuts the summit of Adwa volcano above the center of this NASA Landsat image with north to the top. This prominent volcano (also known as Aabida, Amoissa, or Dabita) is a stratovolcano in the southern Afar area immediately east of Ayelu volcano, which lies above and to the left of the westernmost flank lava flow. These prominent young basaltic lava flows were erupted from vents on the west, east, and south flanks of Adwa volcano and overlap a sedimentary plain to the SE. There are no samples for Ayelu in the Smithsonian's NMNH Department of Mineral Sciences Rock and Ore collection. Large Eruptions of Ayelu Information about large Quaternary eruptions (VEI >= 4) is cataloged in the Large Magnitude Explosive Volcanic Eruptions (LaMEVE) database of the Volcano Global Risk Identification and Analysis Project (VOGRIPA).